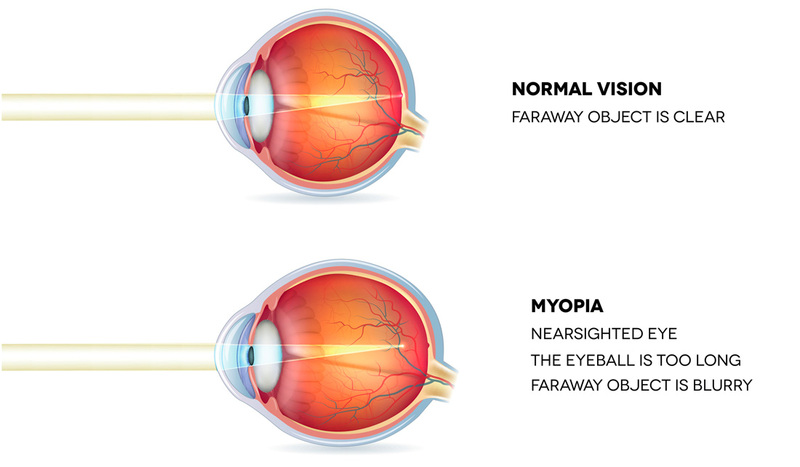 Myopia is shortsightedness or nearsightedness. It’s a common vision deformity. According to an AIIMS study around 13 percent of school going children in India suffer from myopia, whereas in China and East Asia around 90 percent of school going children suffer from myopia – an epidemic proportion. In a myopic eye, the eyeball is slightly longer than the normal eyeball from front to back. Due to the elongated eyeball, the light rays focus at a point in the front of the retina, rather directly on the retina. This blurs the distant images whereas the nearer objects appear clearer. With an increasing number of school going children suffering from myopia, is there a reason to worry? After all, corrective glasses do help in getting 6/6 (perfect vision). Yes, there is a reason to worry. Young children with myopia are more likely to suffer vision problems later in life. They have a longer eyeball and their retina is stretched over a wider area. This increases their risk of developing retinal detachment, cataracts, glaucoma and macular degeneration, which could even cause blindness. The reasons for myopia are as follows. The genetic story of myopia gives an incomplete picture because it fails to explain its progression in cases where parents do not suffer from myopia. Moreover, the genetics do not change in a jiffy. There is definitely an environmental component that can be controlled. Worldwide ophthalmologists recognise myopia as an eye disorder related to voracious book readers. Eyes are strained more by close viewing than by distant viewing. Explaining the doubling of myopics in the last ten years the AIIMS study blames the more number of hours spent by children on electronic gadgets. Computer screens display images in pixels – the tiniest pieces of any image and the eyes need to work harder than reading a traditional book. Hence, it gets tired. Close work for a longer period of time requires a strong focusing effort by the ciliary muscle which controls the shape of the lens of the eye. This puts the muscle in a state of stress. In the long run, the muscle will elongate and your child’s vision will become blurry. But, before this happens there will be symptoms like eye-fatigue, tearing or watering of eyes which are signs of overworked eye muscles. You need to take note of those and encourage your child to spend more time outdoors because eyes were not meant for viewing close objects for such long hours. Ian Morgan, a myopia researcher at the Australian National University in Canberra estimates that children need to spend at least 3 hours daily under light levels of 10,000 lux or more to be protected against myopia. This is about the same level experienced by someone under a shady tree, wearing sunglasses on a bright summer day. An overcast day can provide less than 10,000 lux and a well-lit office or classroom is usually no more than 500 lux). Exposure to natural sunlight is like a balm for the eyes. Children should be encouraged to play outside in the sunlight. At home, during the daytime, try to get as much natural as possible. Many classrooms in Singapore and Taiwan are now designed to increase the exposure of the students to the natural light. Corrective glasses and contact lenses give a myopic 6/6 (perfect vision). However, if your child has got myopia while she is still in school, there’s a greater probability of her power increasing because eyes grow like the rest of the body. Therefore, she needs to learn a few techniques to refresh the tired eyes so that she can keep the vision deterioration in check. These exercises will also help children and adults who do a lot of close work. Instead of making them chores you can make them fun by joining the kids. Not only your child but you also would benefit from the power of these exercises. Squeeze your eyes shut without straining your eyes. Repeat it 10-20 times. It is also called the blinking exercise where you shut and open the eyes. Relax the eyes through palming – Clap the hands together, then rub them vigorously, creating warmth. Close the eyes and cup the palms of the hands over the eyelids. Hold them there for a moment, breathing deeply. Feel the warmth and energy penetrating the eyes. Breathe and relax. Move the fingertips down over the eyelids, and gently massage them in a circular motion, working your way out to the temples. Lightly press the upper eyelids using three fingers of each hand. Hold them there for 1-2 seconds, then release. Repeat 5 times. Roll your eyes clockwise, then counter-clockwise whenever you sit to relax. Repeat 5 times, blinking in between each time. Focus on a distant object (over 150 feet or 50 m away) for 10-15 seconds. Then, slowly start seeing a nearby object (less than 30 feet or 10 m away) without moving your head. Focus again for 10-15 seconds, and go back to the distant object. Do this 5 times. Improve your vision- Hold a pencil at your arm’s length and move your arm slowly towards your nose. As you do this your eyes should follow the pencil. Repeat it 10 times. Most parents see Myopia as non-threatening and accept wearing glasses as a part of growing up. But would you accept permanent leg crutches on your child after she has broken her leg? Just as leg crutches help her to walk when she is recovering from a broken leg, glasses give her the instant gratification of being able to suddenly see clearly with eyes that have lost the ability to focus well on their own. Glasses are a quick fix. However, they don’t address the root causes that allowed your child eyes to get out of shape in the first place – the deformation of the actual shape of the eye. This is not right and needs to be controlled by sending children outdoors, exercising and taking all preventive and corrective actions. Your child will thank you for this.